The Church is not just the bishop, priests and religious. It comprises also, and in the majority, lay people, of whom Pope Pius XII said ‘You are the Church” . In keeping with this dictum of Pius XII, the parish of OLPH has witnessed, and continues to witness a number of generous lay people involved in, and committed to building Church. With a dwindled staff of a number of priests, and now, a permanent deacon, it is essentially the lay people who ensure that the parish functions smoothly. There are those involved in family life ministry, lectors, Eucharistic ministers, those who perform funeral services, those who undertake catechetical instruction of children and adults, members of parish council and those involved in “hidden ministry” – those who do significant specialized work within an established ministry namely fund-raisers, technicians, caterers, sales persons etc. There are other notable groups and ministries in the parish of Our Lady of Perpetual Help which are involved in giving service to God’s people. Among them are the St. Vincent de Paul Society, Breadline, Legion of Mary, Zion Community and Cluny Eucharistic Centre, are all well known for their boundless love for humanity; To find out more about the involvement of lay people, kindly call or visit the P.S.R.s in the office. There are those who assist with the weekend liturgy, such as Extraordinary ministries of Holy Communion, Lectors, Altar Servers and Hospitality Ministers. There is a coordinator for each mass group in each of the ministries and an overall coordinator. Arrangements at Vistabella and Les Efforts are slightly different but the ministries are the same. These assist the chief celebrant of the Sunday worship so that the priest celebrating will be able to focus more clearly on the liturgy and have a greater sense of inclusion and participation in what is the community’s celebration for the glory of God. There are also choirs/ choir leaders for each of the worship times and the persons who assist the congregation in giving their offerings (collectors). There are those who produce the weekly newsletter and other handouts provided to the members of the congregation from time to time. At OLPH, a body of young people whose love for the Church draws them to assist the bishop, priests, deacon and lay ministers in the celebration of the sacred liturgy meets every Saturday from 1.30 p.m. – 3.00 p.m. in the youth space and they are grouped according to the Mass at which they serve. Matthew, Mark, Luke, John and Peter are the group names as described earlier to which altar servers are grouped into. Their service adds dignity to the liturgical ceremonies. Their uniform is a white gown with a “throw over” according to the liturgical colour. They also wear altar servers pins which vary in colour, with a cross and indicates that these persons are altar servers. Altar Servers in OLPH are guided by their respective Team Coordinator. The general coordinator for OLPH is Mr. Kryston Johnson In Les Efforts, the general coordinator is Ms Antoinette Gervais and in Vistabella the general coordinator is Mr Justin Ragoonanan. The unit of the Legion of Mary is called a praesidium, which holds a weekly meeting, where prayer is intermingled with reports and discussion. The Praesidium of Our Lady of Perpetual Help for 2016 has newly elected persons. The Family Life Ministry of Our Lady Of Perpetual Help Parish San Fernando includes Saint Andrew Kaagwa, Vistabella and Christ the King, Les Efforts Communities. The ministry is made up of committees and units with responsibility for education, bereavement, counselling and marriage preparation. “The Family has the mission to guard, reveal and communicate love as a living reflection of God’s love”. With the above in mind the FLM provides marriage preparation, weekly counseling services for families and individuals, counseling for the bereaved and promotes and sponsors projects and special events. Married couples are celebrated at the Feast of St. Joachim & St. Anne. From time to time the ministry keeps the community informed through educational workshops. 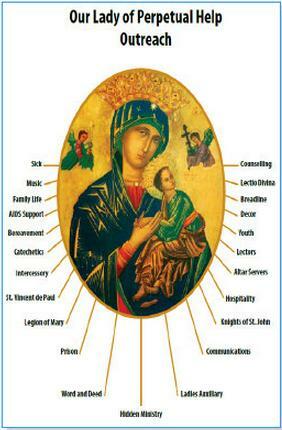 The Family Life Council of Our Lady of Perpetual Help Parish. The Council is made up of 2 representatives from each Family Life committee / unit viz Bereavement / Education / Counseling /Christ The King – FLU / Marriage Preparation (1 rep. only). To make arrangements for marriage preparation, family or marriage counseling or to find out more information about the involvement of family life in our parish, kindly call or visit the P.S.R.s at the office. Over the past two decades the Youth and Young Adult Ministry of OLPH has evolved. Under the stewardship of Andrew Joseph, from the late 1980’s to the early 1990’s the group YOUNIT (Youth United) was formed. This group targeted youth and young adults of the parish between the ages of seventeen and thirty-five and provided an opportunity for persons in the targeted age group to experience weekly prayer, to fellowship with persons of like mind, as well as discuss the challenges experienced in living their catholic faith. As typically happens within youth ministry, due to changes in life situations – persons entering universities, starting jobs and in some cases getting married and starting their families – YOUNIT eventually dissolved. In 1998 however, Fr. Clyde Harvey was instrumental in the formation of the parish Youth Commission whose mandate at that time was to oversee and develop Youth Ministry in the parish. Between the years 1998 and 2010, the Commission under the successive leadership of Charmaine Cardenas and Josefina Baptiste-Mohammed, was responsible for some notable achievements both in the parish and also as members of the Southern Deanery Youth Council, the Southern Vicariate Youth Commission and the Archdiocesan Youth Commission. An informal motto of the Commission was, “if you ask for the help of one Commission member, you get the help of the entire team”. In late 2012, a leadership programme was launched for young adults and number of youths graduated from the programme and became the leaders of YOU.SER.VE. YOU.SER.VE is the name chosen by the young adults of the parish for a new youth group. They began to meet soon after the World Youth Day 2011 experience in Spain. The group started with about eleven members and the main study text is The YOUCAT – The Catechism of the Catholic Church for Youth. On Saturday 14th January 2012 they began a youth leadership training programme directed by Juliana Valdez and Marlene Emanis-Tobas. This was designed to enable the leaders to provide opportunities for young people of the parish who will be confirmed, to remain involved and committed. The group meets every Tuesday at 6.00 p.m. in the basement of the presbytery. This group of young adults have launched a You.ser.ve Teens which meets on a Friday at 6pm. Currently the leadership of the You.ser.ve is furnished by Mr Denzil Williams and he is supported by a team of committed adults to the nourishing and formation of the young people of the parish. We make this prayer in the name of Jesus Christ your son. The youth of a parish are part of the re-vitalized southern vicariate youth ministries. They are clustered into four groups named after the four evangelists. There is usually a major gathering for southern vicariate youth in Penal every second Sunday in Lent. There are presently three youth ALPHA Programmes being conducted simultaneously in the Southern Vicariate; New Grant, South Oropouche and OLPH. S.V.P. first established its presence in San Fernando in the early 20th century under the patronage of Notre Dame de Bon Secours. The major accomplishment of this conference was the construction of the Home for the Aged at Independence Avenue in 1931. In 2001 this facility was expanded and improved to accommodate more residents. The OLPH Conference is now a mixed conference. The aim of the conference remains the same – alleviating material and emotional suffering of the poor by providing foodstuff, clothing and financial assistance while preserving their dignity. Since their existence, we have assisted hundreds of families in our parish and other parishes and with the growth of the parish and the establishment of the two sister communities, two additional conferences have been introduced. The Les Efforts Conference looks after the financial aspect of the Home for the Aged, while the St Andrew Kaggwa Conference is fully involved in ministry to the poor of the Vistabella area. To learn more about the involvement of The Society of St. Vincent de Paul at OLPH or to learn how you can contribute or become a part of the cause, call Mr. Terrance Lakatoo at 305-1515 or visit the PSRs at the parish office. The group meets on Wednesdays at the St. Vincent de Paul Room (Room 2 downstairs BMA). The labour of love, with the guidance of Fr. Pierre, had been preached by Florence Achong (deceased), and her group of ladies who acted as a catalyst for the present Breadline Ministry. Fr. Harvey introduced the idea of a sit down meal for the underprivileged. Previously done on a Tuesday, now every Wednesday is noted for the eating, greeting and lively fellowship, as over 120 persons are served at table by volunteers. Lunch is served from 12noon on Wednesdays. A balanced meal accompanied by a beverage and followed by dessert, is provided by friends and parishioners. All are welcome, be they from around the city, Port of Spain, Point Fortin, Moruga or Mayaro. To learn how to become a volunteer of the Breadline Ministry or to learn about how you can contribute to the ministry, simply contact Ms. Esther Son-Lee at 743-6977 or visit the PSRs at the parish office. In recent times, students from Presentation College and St Joseph’s Convent San Fernando have been assisting with the serving of the meals as an act of giving back to the community.